I could tell you a few things about this pie. For example, it weighed well over 6 pounds – I wouldn’t know exactly how much because my kitchen scale tops out at 6 and I was too lazy to carry it upstairs to the bathroom scale. Another thing I could tell you would be that making it reminded me of making bread. Time consuming but without a lot of hands-on time – just babysitting time. But all you really need to know is in the title of the post. If you took a look at my “Desserts” notebook, recipes I have been cutting out of magazines for the past 16 years, you would notice a heavy bias toward chocolate. I do have those “other” recipes that jumped out at me for one reason or another and this is one of them. The crust is a basic graham cracker crust with some crushed peanuts thrown in. 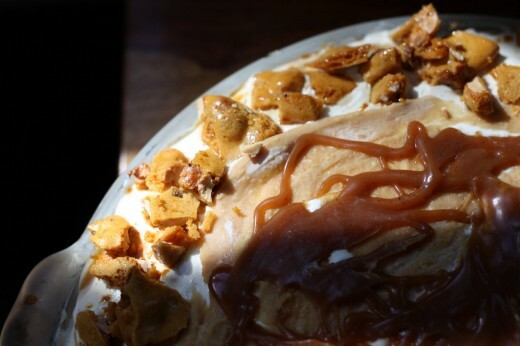 Then you have a layer of ice cream drizzled with peanut butter, homemade caramel sauce, and (my added touch) homemade peanut brittle. 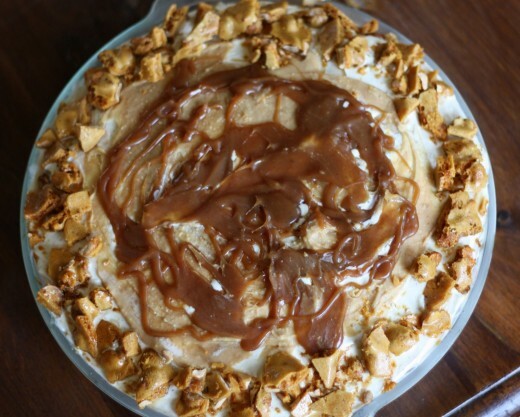 On top of that you have another layer of ice cream which is also drizzled with peanut butter, caramel sauce and peanut brittle around the edges. This pie typifies me as a baker. After I globbed the peanut butter and caramel sauce on the top, I realized that I could done it much more artfully. I could have smoothed the peanut butter better and could have piped the caramel on top in a crisscross pattern – how lovely that would have looked! Note to self for next time. Artisitc is not my game, delicious is, and this was truly extraordinary. No one complained about the gloppy looking top. In shopping for the ice cream, I found out that Haagen Dazs has a new line of ice creams called “Five”. Each flavor only has five ingredients making the flavor more pure and actually lower in fat. I was thrilled with the vanilla – you could see the flecks from the bean throughout the ice cream. Place cream in a small saucepan. Scrape in seeds from vanilla bean; add bean. Bring just to simmer. Mix in butter and sea salt; set vanilla cream aside. Preheat oven to 375 degrees. Line 9-inch diameter pie dish with foil. Finely grind graham crackers and brown sugar in processor. Add butter and vanilla; blend until moist crumbs form. Add nuts; blend just until finely chopped. Using plastic wrap as aid, press crumbs firmly onto bottom and up sides of foil-lined pie dish. Freeze 15 minutes. Bake crust until brown, about 15 minutes. Freeze 1 hour. Using foil, lift crust from dish; carfully peel off foil. Return crust to pie dish. 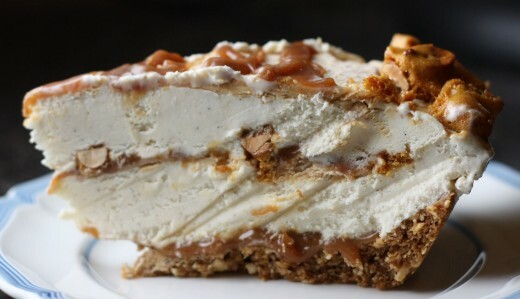 Drizzle 1/2 cup caramel sauce over bottom of crust. Freeze 30 minutes. Spoon 1 1/2 pints ice cream into crust; smooth top. Drizzle 3 tbsp. peanut butter over, then 2 tbsp. sauce. Sprinkle with 1/2 cup brittle. Freeze 1 hour. Spoon remaining 1 1/2 pints ice cream over; smooth top. Drizzle 2 tbsp. peanut butter over, then 2 tbsp. sauce. Sprinkle edge of pie with 1/2 cup brittle. Freeze 4 hours. Cut pie into wedges. Rewarm sauce and pass separately. All I have to say is DELICIOUS. Thank you for making such a lovely dinner and sinful dessert last night. We enjoyed every minute of it! Wow, delicious! I might have gained weight just by looking at it. One word: WHOA. My jaw literally dropped when I saw that picture. Very nice. I’m making this as I type. Done with all the main components and now in the building phase. It will be served at our Mother’s day family extravaganza on Saturday and I am 100% sure it will be a smash. I’m going to make a version of this! Can’t wait. Just in the building phase of this pie, now, too. And I am certain it will be a smash. If you are looking for a good jarred caramel sauce, try TRADER JOE’S Fleur de Sel. I could eat it straight out of the jar! I LOOK for things to use it on and in!